Nov. 21, 2013 – One of the worst Christian massacres—complete with mass graves, tortured-to-death women and children, and destroyed churches—recently took place in Syria, at the hands of the U.S.-supported jihadi “rebels”; and the U.S. government and its “mainstream media” mouthpiece are, as usual, silent (that is, when not actively trying to minimize matters). The massacre took place in Sadad, an ancient Syriac Orthodox Christian habitation, so old as to be mentioned in the Old Testament. Most of the region’s inhabitants are poor, as Sadad is situated in the remote desert between Homs and Damascus (desert regions, till now, apparently the only places Syria’s Christians could feel secure; 600 Christian families had earlier fled there for sanctuary from the jihad, only to be followed by it). In late October, the U.S-supported “opposition” invaded and occupied Sadad for over a week, till ousted by the nation’s military. Among other atrocities, 45 Christians—including women and children—were killed, several tortured to death; Sadat’s 14 churches, some ancient, were ransacked and destroyed; the bodies of six people from one family, ranging from ages 16 to 90, were found at the bottom of a well (an increasingly common fate for “subhuman” Christians). The jihadis even made a graphic video (with English subtitles) of those whom they massacred, while shouting Islam’s victory-cry, “Allahu Akbar” (which John McCain equates to a Christian saying “thank God”). Another video, made after Sadad was liberated shows more graphic atrocities. What happened in Sadad is the most serious and biggest massacre of Christians in Syria in the past two years and a half… 45 innocent civilians were martyred for no reason, and among them several women and children, many thrown into mass graves. Other civilians were threatened and terrorized. 30 were wounded and 10 are still missing. For one week, 1,500 families were held as hostages and human shields. Among them children, the elderly, the young, men and women…. All the houses of Sadad were robbed and property looted. The churches are damaged and desecrated, deprived of old books and precious furniture… What happened in Sadad is the largest massacre of Christians in Syria and the second in the Middle East, after the one in the Church of Our Lady of Salvation in Iraq, in 2010. In the Iraqi attack of 2010, al-Qaeda linked jihadis stormed the church during service killing some 60 Christian worshippers (see here for graphic images of the aftermath). While the archbishop is correct that this is the “largest massacre of Christians in Syria,” it is but the tip of the iceberg of the persecution the nation’s Christian minority has suffered—including beheadings, church bombings, kidnappings, rapes, and dislocation of hundreds of thousands of Christians—since the war broke out (see Syria entries in monthly persecution series). That no “human consciousness” is to be found in the White House, or in the editorial offices of the leading Western media, is now a matter of well-established record. Just try searching for “Sadad” (or alternatively “Saddad”) on the websites of the Department of State or The New York Times. Ditto the leading European dailies, the CNN/BBC/RTF, the human-rights defending “NGOs” et al. The problem, of which Archbishop Selwanos Boutros Alnemeh appears unaware, is no longer in the Western elite’s mere indifference to the impending demise of Christianity in the lands of its birth, but in its active, ongoing, and open contribution to that demise. Cyprus (1974) and the Balkans (1991-9) provided the test, Iraq (2003-today) the conclusive proof. In Syria the Obama administration remains committed to supporting the rebels—ah, yes, only the “moderate” ones, like the Christian-murdering “Free Syrian Army” (discretion advised again), not “even though” the result will be the same, but precisely because it will be. The most precious in the whole universe [his family], are now gone, leaving me alone, but thank God I am still surrounded by these loving people who remain. I want to say, let people [the jihadis] return to their minds. The problems of the world can only be solved by knowledge and brains. Enough insanity, the nerves of the people are shredded. Enough, enough—return to your minds; you people, you humans—return to your humanity, enough crimes. As a sign of the times, here is a Syrian, an “easterner,” evoking rationalism and humanity, products of the Christian West, at a time when the post-Christian West is governed by anything and everything—propaganda, emotionalism, mindless indoctrination—but the twain. by Raymond Ibrahim, author of Crucified Again: Exposing Islam’s New War on Christians (Regnery, April, 2013) is a Middle East and Islam specialist, and a Shillman Fellow at the David Horowitz Freedom Center and an Associate Fellow at the Middle East Forum. 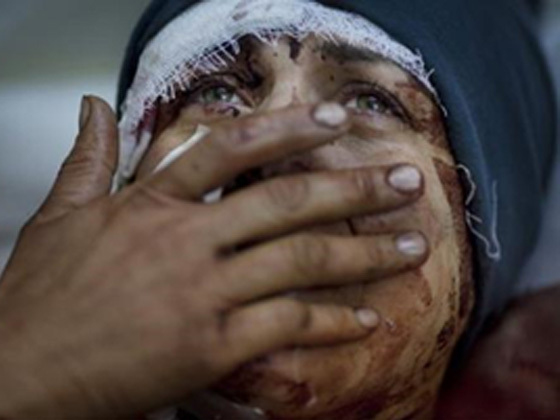 By VOICE OF THE PERSECUTED in Christian Persecution News, Middle East, Syria on November 21, 2013 . I’m sure Obama and his mob are really enjoying this news. Perhaps he isn’t hearing about it. After all, he didn’t know about the Obamacare website not working until someone pointed it out to him in the newspaper. I agree. What are you waiting for? Why are you waiting for someone else to do it? Send it to the WH, your local newspaper, TV news stations, friends, family, anyone who will listen. We seem to be a society of concerned citizens who sit on the sidelines waiting for someone else to take matters into their own hands, watching life pass us by and not getting involved b/c we might get our hands dirty. Such is the case w/ our own government right now becoming what our forefathers warned us about and seeing it happen before our very eyes and doing nothing about it. this is not about putting a political party down! this is about praying that no human group would be killed because of their religion! I sent it to my local TV station but they haven’t published the story yet. No mention at all of Christian persecution. It is just like pre-WWII Germany and the news media of the time in the west refused to believe what was happening. Most local newspapers, radio and television stations are biased to the left so they will choose to ignore this. I’m pretty sure they already know it is happening but they just can’t stand to make our current administration look bad… but then again, it’s always worth a try .The few right leaning media outlets we have in this country are already reporting this story. People have been beimg killed for their religion since the dawn of time, the only difference now its for no reason cuz no one will stop them, I agree write to your papers but it will do no good the media only reports what it wants us to hear not whats really going on, best thimg to do is pray and pray hard, like u have never prayed before, God will sort it out in the mean time PRAY!!!! Our media would never cover this. Our media is owned. Our government would not want this coming out. Obviously – they already know how our militant money is being handled. I think Obama knows, he just doesn’t care…further more, he is involved with the wrong side! Evil under the guise of greed and power – age old and everyone knows but those in power won’t reveal themselves – EVIL CANNOT LIVE IN LIGHT! @alkidya – I don’t think they ‘refuse to believe what is happening’ (now or in WWII), I think there are other factors at play, such as the political threat. The government controls all our media and funds a lot of it (indirectly). They can’t expose them to such an extent. They are forced to keep quiet using several threat tactics. I even remember learning this in HS years ago regarding WWII. Also, no one cares! My family is from Iraq and fled to escape the Gulf war in the early 80s. My dad insisted on going back, even after I was born, but there was nothing to go back to. The people in Syria, many of them have fled Iraq recently and are living as refugees or illegals there just to escape persecution. When Our Lady of Perpetual Help Church was attacked in Iraq in 2010 we held protests at the Federal Bldgs all over the country. Do you really think anyone listened? or cared? The Federal Building learned of our plan (we planned a certain day/time across the country) and people went home early, others shut their windows. We wrote our congressmen only to receive a generic reply back to the extent of “we are working on it.” They are full of it and they dont care. And they are the reason we don’t hear about ANY of this in American media streams. Besides, we are too busy worrying about who Lady Gaga pissed off recently. Clearly, that’s more important. “return to your minds; you people, you humans”??? These are not humans…they are lower than the lowest life forms. They are simply sinners like the rest of us who need to repent. There is still forgiveness even for their crimes and atrocities. Amen! We must pray for them. I personally find it hard to forgive a persecution like this. For evil keeps spreading like a vile disease. Forgive someone when they seek forgiveness. But when they’re spreading non-stop iniquity and violence ESPECIALLY against innocent children… in my eyes should be punished severely for it. I know people say it’s up to God to judge, and I agree with that. But when somebody slaughters several civilians who were seeking peace and slaughter children… they have to be stopped. It goes for anybody or anything. If evil refuses to stop, it has to be stopped. Stephen when he was being stoned looked to heaven and prayed that God would forgive them for they did not know what they were doing. These people are sinners walking in ignorance of God. As much as my heart breaks for my fellow Christians I pray all the more for the salvation of their captors. and yes, Christ is greater than the works of the evil one and even loves the ones being used by the evil one. We even pray for their salvation of those responsible for these despicable acts, for their repentance, and for the children and many families in the middle east to know Isa (Jesus the Perfect One) as well. all who trust in Jesus are victorious and will live forever no matter what. death is swallowed up in victory and may forgiveness and love show God’s power is greater than the worst evil on earth. Stephen had a vision, and said, “Lord, do not hold this sin against them” while being stoned. He didn’t say “for they do not know what they are doing”. It was Jesus who said those words while he hung on the cross, and some believe he was saying it of the Romans and not of the Jews since it was the Romans who did the actual crucifying, but it’s true the Romans really didn’t know why they were doing what they were doing. That said, what matters is that we forgive. Matthew 5:10 Blessed are those who are persecuted because of righteousness, for theirs is the kingdom of heaven. 11 “Blessed are you when people insult you, persecute you and falsely say all kinds of evil against you because of me. 12 Rejoice and be glad, because great is your reward in heaven, for in the same way they persecuted the prophets who were before you. That’s exactly the excuse that they use to persecute Christians. We must not let Satan trick us into believing it, too. I agree with all of those below that have commented that the persecutors are sinners in need of a saviour – as much in need (and as much loved by God) as those that they are persecuting. Christ died so that they might be saved – and it was worth the risk. These attrocities explain exactly why The Christ is the real and existent evidence of God in the place…turning the other cheek etc, He was silent to the slaughter and all the while his actions of peace are highlighting the evil of a deceived humanity. The worst thing a racical Christian can do is to obey Christ…to love one another despite the cost…the worst thing a radical muslim can do is behead the infidel for his/her salvation. The offenders cant return to humanity because their world view forbids it. Let us pray for them…the One True God Yahveh loves them no differently to anyone else. That’s what they say of Christians. Lets rise above that kind of thinking lest we join them in atrocities of our own when we have the upper hand. Everyone is made in the image of God. There is none that are made in any other way. Jesus said to pray for your enemies, bless those that persecute you. If you are not willing to do what He says then why bother to call Him Lord? He also to pray for your leaders. I take these stories and I post them on the FB pages of CBS, NBC and ABC… I scream, where is our PRESS?… I hope 2 or 10 people see it before they take it down… I try to embarrass them. Maybe 10 more will know tomorrow. Thank you for being a Voice! Great! God will definitely use that!! Hallelujah!! How do we post in on ABC news Australia??? I’ve just tried but had no luck. sorry, that wasn’t clear … their facebook site is what I was trying to post to. I just posted this on those three fb pages. What a great idea! Thank you for sharing! I will post on our local news FB pages as well…thank you! I shared this with my congregation on Sunday. Someone claimed the money did not go to Jihad. Can you site any further proof or sites? I have more, but here’s the video of Clinton admitting we created al-Qaeda. This next video is very telling it is a Syrian Woman who bravely slams Mccain’s foreign policy, and his lunge to aid the rebels and attack Syria. Maybe comment on this excerpt: “The main Western-backed rebel alliance, the Free Syrian Army, distanced itself from the five rebel groups named by the HRW as the main perpetrators. “Anyone who commits such crimes will not belong to the revolution anymore,” said spokesman Louay Mikdad. Wouldn’t a ‘fair and objective’ media cover all of the events – so that we are not forced to rely on the soundbites of those who have a stake in the war, and more specifically, in downplaying and distancing themselves whether in truth or deception from these events? And yet millions or billions are still being sent there! Paid killers? My heart hurts and my spirit sickened when I read this. Apparently some are not able to determine basic right from wrong. I would bet we don’t know all what happened and I believe our administration is PAST FEELING, but I will pray for these people being wrongly persecuted unto death. Based on what has been told by refugees and others from within the nation, all incidents have not been documented. We must stay in prayer for those being persecuted and please remember to pray for their persecutors. They are lost in darkness needing the love and light of Christ. Is it just me, or do these pleas for help sound like the Jews in the 30’s and 40’s who could not convince our government that they were in trouble? It’s not just you, it sounds exactly like what was transpiring in WW2. History is about to repeat itself! Pray, my brothers and sisters, pray for them, that they may be strong and God to comfort them. Tears roll down my face when I read this. The world will always hate Christians. I am not surprised nobody reported this. God will wipe their tears and heal their wounds because they loved him and remained faithful unto their death. Strong prayers of strength and courage go out to those left behind. And stronger prayers go out to those that have set the world in this direction. Shame on you for your ignorance and intolerance. I am told that I have to be mindful of others and keep my faith quiet so as to not offend others but those very people who tell me this allow this atrocity and many others to go unnoticed. Eye opening and absolutely heart breaking! Praying for my brothers and sisters being persecuted! The Christian religion and people of faith in particular, are under attack as never before. Keep in your mind this truth: the real enemy is not the government or news media, or Syrians. The real enemy is Satan, and he hates us because he hates Christ. Thank God satan has been defeated, and is working on borrowed time. We will endure. I watched this video this morning and it hit me hard. I will let it speak for itself. But it’s time to take a good look at what is going on there. Praying for Syria. Praying for our Brother’s and sister’s in Christ, praying for the innocent people caught in this. And people are boo-hooing about Duck Dynasty. Dear ignorant, THIS is what it’s like to be tortured for your beliefs. THIS is what real Christian hate is. Not because, heaven-forbid, some atheist called you stupid or a family that isn’t yours can’t continue their show. How would you like to get your limbs ripped off and family raped in front of you? Do you have a house? Do you live in daily fear of getting slaughtered because you have a Bible in your house? People need to get outside of the United States and realize what true discrimination is. Actually, the Quran commands them to kill Christians. Extremists are the ones who follow it. The peaceful Muslims are not obeying this command (thank goodness :). We should be boo-hooing about Duck Dynasty because this is where and how it begins. It is a symptom of the persecution that is coming and has started to come even to our own borders. It may seem like a silly thing but soon speaking out as Phil Robertson did will mean more than just a cancelled show. Americans go happily along, whistling their merry tunes and believing that life will always be as it was. But there is a serious evil going on below the surface and the ugly is starting to seep to the top. There has been more persecution of Christianity in the US since this current admin took over than in all the years before. Things like this should be a wake up call but our society has been dumbed down and programmed to let it happen. May Jesus return soon! Not only do you bear my name, but you bear my heart! Thank you! @ Katie 123. Do you agree that it all started Small,? Just like the Robertson case. I say ” Nip it in the Bud ” Here in this country before it gets any worse. You may have missed it at the bottom. When I read of these horrible atrocities I am reminded that Jesus Christ, my Savior, died for the sins of liars, cheaters, and these murderers. That is why he cried out, “My God, why have you forsaken me?” His death was more horrible than we can imagine. Forgiveness is theirs to accept or reject. It is so terribly sad to read of this and try to figure out what we as a nation should be doing. I know that as Christians we should be praying that our leaders and decision-makers will have Godly wisdom. Every land where the USA steps on, followed by death and despair! The day will come when she dies out like the Roman Empire, and people will only know about the USA by studying history! I can’t really say that I disagree with you Istvan, Not all Amercans approve of what the leaders do. And I do disagree to an extent because the values our country was founded on, and I’m speaking of Christian values and God’s word. The word and testimony of Christ will never die. Jesus said in Matthew 24:35 “Heaven and earth will pass away, but My words will not pass away. The Gospel of Christ will live on forever. And so shall the prayers of the saints. So sad this is the first I have become aware of this atrocity, bad news for Christians are experienced everywhere in the world today. I don’t think it will be long before we see things happen here like they did in the pre ww2 German society. Not long at all, the current social feeling is that we should not preach Christ’s gospel except at Christmas and Easter. There are groups in the U.S. devoted to freedom from religion whose goal is to block Christian faith from being openly expressed in the public square. No we will soon be facing open persecution even in this country which has all but silenced the voice of Christ. Then the dragon became furious with the woman and went off to make war on the rest of her offspring, on those who keep the commandments of God and hold to the testimony of Jesus. Let’s make the media give attention to this story! I pray for the peace of the persecuted, and the persecutors. I will not voice hateful words towards them or anyone else who does not choose to believe what I believe. All I can do as an individual is constantly search my own heart for darkness through the Spirit of Truth, root it out and shine forth love for all, not just those of my choosing. I pray for this for everyone but especially for those who are willing to condemn others that they see the true light of God. I pray Acceptance, peace, love and understanding of all of creation. As I read the comments, I’m saddened that some who profess Christ do not put for the same fervor when others of other faiths are massacred every day. Regardless of faith, people do not deserve to be massacred for what they believe in. Let’s give others (in our words, thoughts and deeds) the same love Christ gives freely to us who believe in him. There has been a lot of truth spoken in response to this article, especially about the need for prayer for those involved. I would add that prayer for the nations’ leaders is also needed, so that wise and courageous leaders would be appointed to deal with these horrible issues and speak out in defense of the truth. The crimes the Jihadis are doing not only against Christians, but against all that is different from them, Alaweet, Druz, and others. last week in Adra the Massacre was against the people who works in governmental sector. Thanks for pointing this out. We should be mourning not only for our Christian brethren, but for all who are suffering in the world. All will suffer and yet more will die never knowing why we were given this chance of conscienceness… sad but true. The never ending suffering state of mankind will only end with peace. I follow this peace. Kill as many as you like. You alone will be held responsible.